Morel mushrooms are a passion for many in the Midwest. Considered by many the greatest delicacy in the mushroom world after the black and white truffles of Europe, they are highly prized by professional and amateur cooks and gastronomes all over the world. Highly fickle, they are difficult to find, and every successful hunter has a different idea of the best places to look. Most jealously guard the location of their favorite morel patch. However, there are certain broad guidelines to follow to maximize the chances of finding these culinary favorites in Ohio and other areas. Morel mushrooms come in several varieties. Experts disagree on the specific number of different species, but most hunters generally recognize the following types; black, white, yellow, and gray. All of these belong to the genus Morchella. There is also a closely related genus Verpa which contains the half-free morel. Morels exhibit a very wide variety in color and pattern. It may be a matter of opinion from one hunter or expert to the next as to what type a particular morel belongs to. What is not in question is that they are all exceptionally delicious. Every successful morel hunter will have different ideas about where to look for these mushrooms, but certain types of terrain and trees seem to be more popular than others. Morels tend to be found near certain tree types in wooded areas. Tulip poplars, dead or dying elm trees, old fruit trees (especially apple) striped maple, hickory, white and green ash, old grapevines and sycamore trees all are good trees to look for when hunting morels. 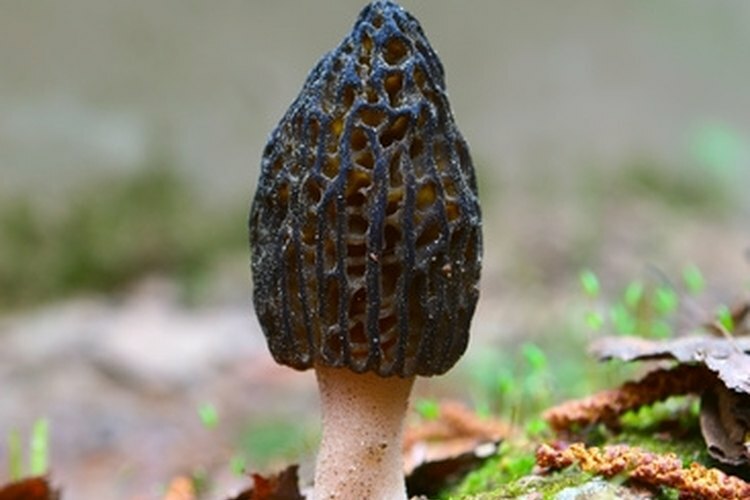 However, morel hunters have reported finding them in all sorts of other places as well: railroad beds, fence lines, yards, construction sites, areas damaged by fire in the previous year, and even bare sand. Part of the fascination with morel hunting comes from the fact that there seem to be no hard and fast rules for finding them. Be sure to get permission from the owner when hunting on private property. Morel season in Ohio usually begins in early to mid April, but some years hunters have reported finding them as early as late March. Black morels are usually the first to appear. Morels appear to need a soil temperature of around 53 degrees F to begin to grow. Most hunters and experts agree that a series of nights with temperatures of at least 52 degrees are needed to initiate morel blooms. However, morels occasionally poke up through melting snow. Rainfall and temperature conditions can change the morel season by as much as two weeks. Yellow and white morels generally begin to appear after the blacks, and the hunting season goes through most of May. Many hunters use indicators in nature to tell them when to look for morels. These are useful because they are independent of the calendar; weather conditions can move the season, and these indicators remain in tune with the morel bloom. Here are a few used for finding white and yellow morels: when the mayapples flatten out; when redbuds are in bloom; when violets are in bloom; when dogwoods bloom; when ash tree leaves show; when trillium flowers are in bloom. Identification of mushrooms should only be attempted by an expert. Never eat a mushroom unless you are sure of what it is. There are false morels that can be dangerous. When beginning a career as a morel hunter, find an experienced hunter to help you. Most morel hunters are glad to help a novice; just don't ask them to show you their favorite spots! Fortunately morels are very distinctive and are not as difficult to identify as some types of mushrooms. There are numerous pictures on the Internet and these can be very helpful.